WATCH Will Security Measure Up This Holiday Season? Last fall, as he had done hundreds of times, Iranian-American businessman Farid Seif passed through security at a Houston airport and boarded an international flight. He didn't realize he had forgotten to remove the loaded snub nose "baby" Glock pistol from his computer bag. But TSA officers never noticed as his bag glided along the belt and was x-rayed. When he got to his hotel after the three-hour flight, he was shocked to discover the gun traveled unnoticed from Houston. "It's just impossible to miss it, you know. I mean, this is not a small gun," Seif told ABC News. "How can you miss it? You cannot miss it." But the TSA did miss it, and despite what most people believe about the painstaking effort to screen airline passengers and their luggage before they enter the terminal, it was not that unusual. Experts tell ABC News that every year since the September 11 terror attacks, federal agencies have conducted random, covert "red team tests," where undercover agents try to see just how much they can get past security checks at major U.S. airports. And while the Department of Homeland Security closely guards the results as classified, those that have leaked in media reports have been shocking. CLICK HERE to follow ABC News Chief Investigative Correspondent Brian Ross on Twitter. According to one report, undercover TSA agents testing security at a Newark airport terminal on one day in 2006 found that TSA screeners failed to detect concealed bombs and guns 20 out of 22 times. A 2007 government audit leaked to USA Today revealed that undercover agents were successful slipping simulated explosives and bomb parts through Los Angeles's LAX airport in 50 out of 70 attempts, and at Chicago's O'Hare airport agents made 75 attempts and succeeded in getting through undetected 45 times. Despite the results, there is no sign that the numbers have changed as the screeners have been tested year after year, former Department of Homeland Security Inspector General Clark Kent Ervin told ABC News. "Those reports were classified but it's sufficing to say that reports, both classified and unclassified, are concerning. Too often guns and knives and fake explosives get through the checkpoint," Ervin said. "And what is particularly concerning is that nine times out of 10 the checkpoint is the most critical layer of aviation security." Ervin said a combination of factors is likely to blame for the persistent failures on the part of screeners. Low pay, poor training, and the monotony involved in watching bags pass through x-ray machines are a recipe for trouble, Ervin said. "To be fair to screeners, it's very difficult work," he said. "After so many hours of seeing things that are innocuous, there's really a limit for the human brain to process something anomalous." Last month, TSA Chief John Pistole told ABC News that the poor performance during undercover tests helped convince him that airport screening needed to get that much tougher -- and a desire to do better helped give rise to the controversial new regimen that includes enhanced pat-downs and back-scatter machines that can see beneath a traveler's clothing. "We've had a series of reports actually going back several years from the inspector general, from the General Accounting Office, and our own TSA Office of Inspection, where they do, as you describe, covert testing," Pistole acknowledged to George Stephanopoulos last month during an interview on Good Morning America. "And unfortunately, [undercover testers] have been very successful over the years. And one of the findings is that we have not been thorough enough. And the concern obviously is, if that's an Abdulmutallab -- a Christmas Day bomber -- who is doing it rather than an undercover agent, then that can have catastrophic results." For Seif, the discovery that he had accidentally carried a handgun on an international flight from Houston came as a shock. Rather than let the incident pass, he told ABC News he felt duty-bound to alert authorities to what he considered a gaping hole in security. When he met with Homeland Security officials upon his return to Houston, he said they appeared eager to remedy the problem. "They were very embarrassed, you know," Seif said. "And -- and they should be, you know. It's -- we're talking about total failure." TSA spokesman Greg Soule provided ABC News with a statement saying the agency was aware of the year-old incident and had taken steps to address it. "We conducted an immediate investigation and remedial training was provided to the security officers involved," the statement said. 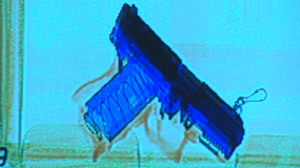 While it may seem odd for a traveler to walk into an airport with a gun in his carry-on luggage, Soule noted that it happens more often than most people think. Posted on TSA's web site is a count of handguns confiscated by screeners at security checkpoints each week. During the first week in December, screeners found 14 firearms, the website says. But the agency will not comment on the performance by screeners in undercover testing. Homeland Security officials have determined that any details on performance at checkpoints could provide a road map for terrorists, said the TSA's Soule. Sen. Charles Grassley, the Iowa Republican who called on the Government Accountability Office to conduct its own, independent covert tests of airport screening, decried the decision to classify the results as a national security secret. CLICK HERE to follow the ABC News Investigative Team and Brian Ross on Facebook and join in on the discussion. "Those results aren't going to help terrorists figure out how to better attack us, and they certainly aren't going to give them any more motivation to try than they already have," Grassley said on the senate floor in September. "Keeping the results secret will accomplish one thing, however. It will ensure that the public has no idea how effective our airport screening strategy actually is."